Have you ever wavered between decisions, weighing out the options, only to choose the more comfortable route? Lately I have found that it is really easy to stay routed in my routine or to simply stay where it’s comfortable. Wake up, workout, work, and come home to watch some television show (currently hooked on Jane the Virgin). Yes, “me time” is very important but there is also room to test the boundaries. You never know what you might find, right? That’s how this blog really came about. Sure it was my way of filling the summer of 2012 if I didn’t find an internship, but it became so much more. It has become a form of accountability, a way of sharing my travels and explorations. ^^ Not very attractive, yet reflective of the places our tribe travels. I’m pretty sure I was chatting with my friend Melissa (who shares the same birthday) and discussing where we should suggest the Friday workout location…so we can select an epic birthday brunch location. Goals. ^^ I actually think this one isn’t half bad. Running pictures are hit or miss and I’ve learned to throw up a shaka and attempt to smile when you see the camera. This may have been on the back half of the course where the wind was brutally whipping around. I also recall passing a table with free beer and oreos. While I didn’t grab anything, I did consider those oreos…my stomach thanked me for not doing so. ^^ A delicious Collagen recovery protein power, which to be honest I was curious to sample out and have to say, it wasn’t half bad. I dabbled in protein powders during my senior year of college (mostly attempts to lose weight but that failed since I would drink the shake and eat my meal) but haven’t tested since. I don’t like it when powders are chalky or have a clumpy texture, but that was not a problem here! I even enlisted a couple of friends from November Project to help me test it as well and they were huge fans! One clutch combination for dinner was banana, frozen blueberries / blackberries / raspberries, cashew milk and the protein powder. Boom. Game changer. NYTimes.com ~ “When a Feminist Pledges a Sorority” ~ I haven’t really talked about my time in Greek life, but I was a Theta (Kappa Alpha Theta). I learned quite a lot during those four years in college and have to say, I was, am, and will always be proud to be a Theta. Sometimes Always Never via Elite Daily ~ “How I Taught Myself to Love in a World Full of Likes” ~ In a way, this is another reminder to live in the moment, allow ourselves to love, and not stress so much about making things perfect. PureWow ~ “The Best Ice Cream in Every Single State” ~ I scream, you scream, can’t we all have some ice cream? I missed out on Tuesday with Ben & Jerry’s Free cone day or rather I decided to not stand in an endless line for a melting scoop. Now that I have this list, maybe I’ll try to hit up a few spots on my way to Boston for Marathon Monday. Let’s Talk Career ~ “Life Is Short – Don’t Be Lazy” ~ Truth. Well + Good ~ “If You’re Approaching Burnout by 30, You’re Not Alone” ~ Shoutout to my famous friend Ali! AdAge.com ~ “Farewell to Kobe Bryant” ~ I never really got into pro basketball but growing up in LA, I have to side with the Lakers. His career is definitely a piece of history – something that we were able to witness. Backpacker.com ~ National Parks to Offer Free Admission April 16-24 ~ Get out and explore!! ^^ And this is how I feel lately. (Thanks to Tricia for finding this shirt ^). Yet I keep running and pushing myself. I have been telling myself that I should take it easy or take a break but does that happen? Nooooope. I even complained about feeling tired yet again to a friend at NP and she said “haven’t you said that for the last 8 months?” Ah good point. Well, I’m continuously in a cycle of guilt and wanting to participate (and often race) EVERYTHING. I may have mentioned that I am testing out Inside Tracker and just got my results back this week. Turns out I am uber low on iron. Good job Kaitlin. That might be one of the reasons I’m always tired. But more on that later. ^^ For now I will focus on the sun and surf because that’s where I’d rather be right about now. Please send this crazy hot/cold weather away and bring me a tropical drink by the sand. 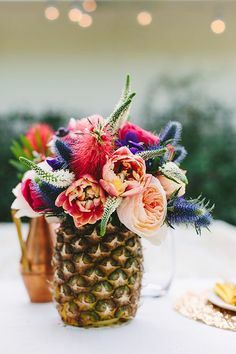 Also, I’ve totally bookmarked this arrangement for a future party because flowers look so much better when arranged in a pineapple. The next few days are all about running and November Project (shocker). It all starts with a bit of Brooklyn Half training and then up to Boston to workout with the NP Tribe and watch Boston Marathon! I promise I’ll swing around with some posts that aren’t so running heavy but for now, have a wonderful weekend! This entry was posted in Favorites, Healthy Me, Life of Late, New York, Running and More, Spring and tagged collagen sports, Inside Tracker, life of late, November Project, random, recovery, running by Kaitlin. Bookmark the permalink. I look forward to this post of yours every week. Love all the NP pics, LOVE all the links, love reading your posts. Love all around. I want to hear about inside tracker!!! 2. In that throwback photo — is that me getting ready to walk over and ask you to stop singing the PEPSI Song or was it Dr. Pepper?? Or COKE!?! the sunflowers a few days later were a nice touch. 3. i love your blogs! I will check that out. You cracked me up with those stories 🙂 miss you!